I’ve recently had my own business cards printed and this inspired me to write an article about the design process and the options available to you. Content is king so make sure you have all the relevant information and corporate messages you want to communicate before we start the design process. The content can sometimes dictate the size and shape of your card. The standard size for a business card in the UK is 85 x 55 mm. Cards of this size will fit into most wallets and pockets. I once overheard someone say “If a business card doesn’t fit in my wallet, I don’t care how beautiful it is, it’s going in the bin.” Only go larger than the standard size if you have good reason to, maybe you own a book shop and would like your business card to be used as a bookmark, or maybe you own a bar and would like your business card to be shaped like a beermat. Die-cutting is the technique used to create custom shapes. The printer will create a metal template based on your custom design and use it like a biscuit cutter on your cards. There is usually a set-up cost involved, especially when you use die-cutting – that “biscuit cutter” has to be made just for you! The cost will be the same if you had 50 cards printed or 1000 printed, so printing higher volumes will work out more cost effective. This is where the printer applies a varnish to designated areas of the card. It’s best used on dark backgrounds and isn’t recommended on fine details as it’s difficult for the printers to be 100% accurate. This is a bit like using a stamp to create depth and colour in the card. This works well with text and simple shapes. Additional inks can be used to make your card stand out even more. Metallic, pearlized and fluorescent inks can produce interesting effects. (To better preserve metallic inks, consider putting a varnish on top.) Pantone colours give your brand a consistent look, as process colours can sometimes vary from printer to printer. But don’t go crazy with Pantones as they add to the printing process and will incur an extra cost. 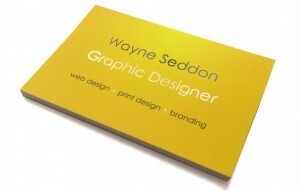 I remember when I was a kid and I made my own business cards, I wanted them to have coloured edges, so I held them all together and used a felt-tip pen to colour the sides. This obviously didn’t look as professional as I had hoped! 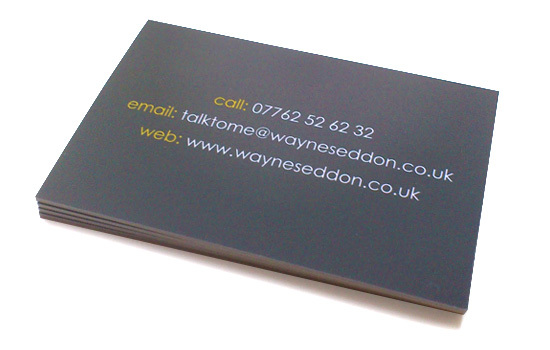 The printers glue an extra piece of coloured card in between the front and back of the business card like a sandwich; this is called triplexing and also referred to as edge-painting or edge-tipping. Duplexing is when only two pieces of card are glued together to create a two-colour edge.